Jamie Wallace (mini Victor) with actor Greg Hemphill who plays Victor in the TV series Still Game. internet sensation after impersonating Still Game’s Victor has landed a part in the real TV series! Second year Douglas Academy pupil Jamie Wallace (13) and two pals have been signed up as extras to play the roles of Craiglang school pupils – in the fourth episode of the current hit series. A video starring Jamie, Cheldon Woodburn (12) and Jordan Cramond (12) as mini Jack, Isa and Victor lookalikes from the BBC comedy got over 75,000 hits online when it was launched as part of a theatre school project last December. The three attend the Glasgow-based UK Theatre School and the video project was designed to raise awareness of the school’s charity status, offering scholarships for talented children. 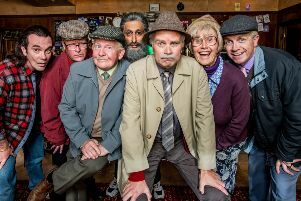 After the success of the video, the real life Jack and Victor – and the show’s creators – Ford Kiernan and Greg Hemphill invited the trio onto the BBC set when they were filming. But there was an even bigger surprise in store when they were asked to be extras for one of the episodes. UK Theatre School principal Lizanne Lambie Thomson said: “We thought the invitation to visit the film set was the icing on the cake – and then Ford and Greg topped that with the request for them to film as extras. As well as the original video a film was made of the mini Still Gamers interviewing celebrities including River City actor Gary Lamont and singers Michelle McManus and Nicholas McDonald. Jamie said: “It has been an awesome experience! We had some nerves of being on the actual set and the excitement of our very own ‘meet & greet’. I wish we could we could do it everyday. “Working alongside the real big stars Ford, Greg and Jane McCarry who plays Isa was a dream come true!